Last week I pondered the honesty and the risks of adding emotional weight to political acts by calling them "worship." If there's actual worship involved, the risk is probably worth taking. There are a number of other ways to give our political rhetoric an emotional wallop. One of the most popular is to be offended, or claim to be. Here in Russia, it may now be a crime to be offensive in a religious context, providing, of course, that you're offending the wrong people. In the town of Greece, New York, local ministers routinely give an opening invocation before town board meetings. These invocations have usually, but not always, been explicitly Christian. 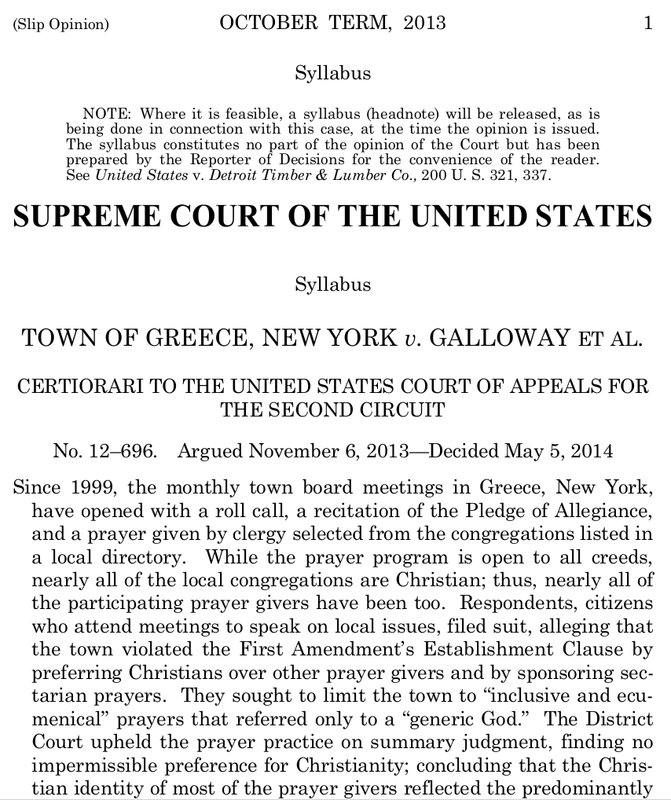 Two local citizens filed a lawsuit, not to prohibit prayers, but to require that they be "inclusive and ecumenical." Susan Galloway, one of the original plaintiffs, found the prayers offered at these town meetings "offensive," "intolerable," and an affront to a "diverse community." The case eventually reached the Supreme Court (from whose opinion I drew these quotations), which has just decided (5/4) in favor of the town's practices. After surveying a lot of overheated articles on both sides of this controversy, I was happy to see Michael Miner's refreshingly calm take on the story. As it happens, I don't agree with him, but I do acknowledge his essential fairness, and admire his honesty in stating that he originally planned to go one way with his article but found one of the dissenting justices more persuasive in the other direction. Miner's assessment: "Kennedy lets common sense waft him along. Kagan thinks harder." It's impossible for me to decide who actually thought harder, but both clearly took the issues seriously. The decision examines whether there were political advantages to be gained by identifying with the majority religion, and whether the town made opportunities available to minority-faith representatives, finding that there was no unconstitutional linkage of faith either way. But much of the majority opinion was simply a review of the history of religious speech in government settings, finding that no doctrinal censorship has ever been required. Such censorship arguably would be required if a no-doctrine standard would now be imposed on religious speech--either a censorship of content, or maybe a quota arrangement ensuring a balance (who decides?) of voices. For me, the decisive issue is somewhat different. Generic religious language is nobody's language. There is no such religion. (Or if there is, its very generic-ness would be a doctrine, a possible source of offense to others.) When I pray, I am expressing a relationship; I would not deny this freedom of expression to anyone else of any religion, and I insist on it for myself, however many or few of my faith live in the community that had invited me to speak. In this sense, an insistence on generic language could amount to an unconstitutional prohibition of religion. Back when I was staffing the Right Sharing of World Resources program, I was on an interfaith committee preparing a study guide for the U.S. Public Broadcasting documentary series, "Local Heroes, Global Change," on economic development and poverty reduction around the world. In our work, I pleaded for an attitude of hospitality to the diverse texts and scriptures we were considering, not a steamroller of homogeneity. I think the group did a good job. And now I continue to believe that we need to risk being exposed to ... and "offended by" ... majority and minority voices. There is something coercive about majorities sealing minorities out of the public space; equally, there is something coercive about a community being told by court injunction that its majority voice no longer holds weight. It's that sort of thing that gives political correctness (a concept I actually honor!) a bad name. In their declarations in the trial court, respondents stated that the prayers gave them offense and made them feel excluded and disrespected. Offense, however, does not equate to coercion. Adults often encounter speech they find disagreeable; and an Establishment Clause violation is not made out any time a person experiences a sense of affront from the expression of contrary religious views in a legislative forum, especially where, as here, any member of the public is welcome in turn to offer an invocation reflecting his or her own convictions. A useful test is implied here: is there actually this kind of access for "any member of the public"? But in any case, I think it is time to challenge the idea that being offended is, without evidence of actual coercion, a trump card in political discourse. If you are offended by someone else's religious speech, maybe managing your feelings rather than suing for relief is part of the price you pay for being in a country where there is religious freedom for the local majority as well as the local minority. Maybe you're thinking, "OK, Johan, that's easy for you to say; you're too often in the majority; you don't know what it's like to be in the minority." And you're probably right. But you might be surprised by how easy it is to offend me. Just say "Waterboarding is how we baptize terrorists." Call me an anti-Semite for criticizing Israeli apartheid. Put a Hitler moustache on a picture of Obama. Tell me I shouldn't say "Merry Christmas." Label Quakers as "heretics" or evangelical Christians as "theologically bankrupt" as people have done to my face. I keep having to remind myself what a therapist once told me: "People have a right to be wrong." Friday update: I am advocating freedom to pray publicly in the name of Jesus, if that is our authentic voice, but I'm not recommending this practice. Just as with worship-as-protest, we must examine our leadings and motives. Are we saying something prophetic, or are we indulging ourselves? There's already enough elitism and spiritual exhibitionism in the world. Just because we are permitted to do something, even under constitutional cover, doesn't mean we should do it. In connection with this recent Supreme Court decision, one thing really saddened me. According to Anthea Butler in the Guardian's "Comment Is Free" column, the two women who brought the original lawsuit received "hate mail and ridicule." And one commenter says that their properties were vandalized and they received violent threats. I'd like to think that none of that ignorance and criminality came from Christians--we love our enemies and pray for those who persecute us, right? Or do we get a secret thrill out of being offended? A chance to smite for the Lord!! "The conflation of orthodox belief and discriminatory social policy is likely to be detrimental to Christian witness in an increasingly tolerant age." -- from Eric C. Miller, "Is Evangelicalism Too Nice?" "Should Jesus inform our Christianity?" and "Would Jesus Support the Death Penalty?" "What the retirement of baby boomers could mean for the church." Alternatives to Violence in Ukraine--an experience in Kiev. Tara McKelvey, "Russian baddies are back." Yesterday and today in my college-entrance-exam classes I used an Eva Cassidy song for the listening comprehension exercise I put at the end of my classes. We heard the song "You Take My Breath Away." I know we've got a good song when students start singing along spontaneously, even though it's not a singing exercise. I couldn't find a live performance video of this song, but "People Get Ready" is certainly not second best! ... "'Cause there's no hiding place from the Kingdom's throne." People Get Ready - Eva Cassidy from acousticguitarnut on GodTube.